I have to write an update on my Kulfi recipe post. I bought earthen pots and froze the milk mixture in that. There was a lot of taste of ice and the khoya didn’t mix in as well. Neither was it creamy. Very disappointing. I will try a different recipe to make it creamier, and post the update. This time I will use popsicle maker that is completely closed tightly. The pots are not closed tightly which makes it taste more “icy”. However, the taste was delicious. I melted the whole thing and had it melted, it tasted like Basudi, a Gujarati specialty made of milk and saffron. I love Basudi! I suggest following the kulfi making directions but instead of freezing it, chilling it in the fridge and having it as a liquid. Yummy! 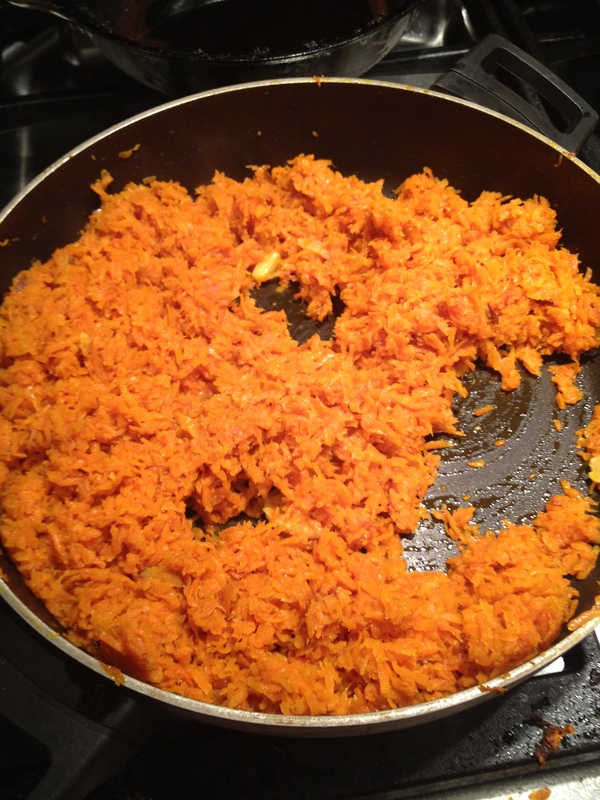 I have some guests coming over tomorrow, so I decided to make gajar ka halwa (carrot sweet) after a long time. When I first got married, I made it often for AM, as they say the way to a man’s heart is through his stomach lol. Soon our girth started increasing at a faster rate than our love, so I stopped making sweetmeats. 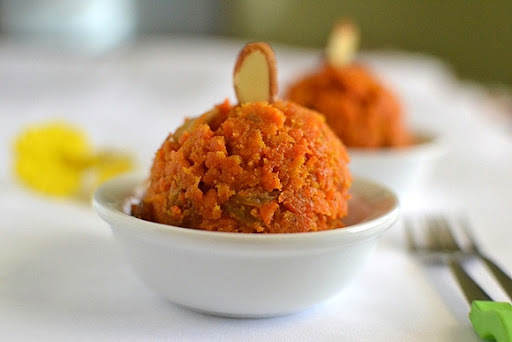 I love gajar halwa, especially when it is hot and crispy. Here is my mother’s recipe. Carrots 1 kilogram, ghee (clarified butter) 3 tbsp, cardamom 2, cashewnuts 3-4, almonds 2-3, khoya/mawa 100 grams, whole milk 2 cups, sugar 6-7 tbsp. Grate carrot. See the quantity in the photo below? Not that I am preparing for an Indian wedding, the carrots will shrink once I heat them. Grating them was a pain, I really need to fork up the money to buy a food processor. 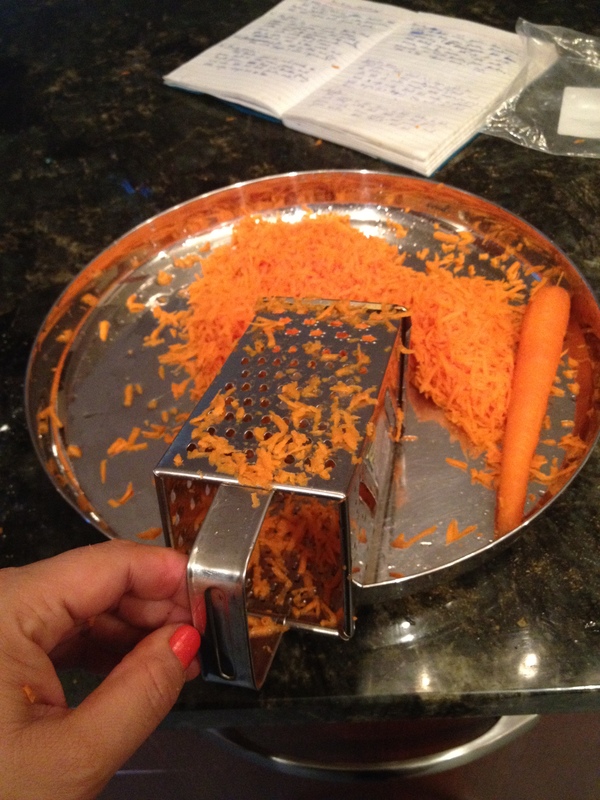 Before grating, cut of both ends of the carrot and peel the carrots. To peel, place the carrot holding by the head in a plate, tilt the knife and slide the sharp edge tilted from top to borrom while moving the carrot round, run the knife on each portion while turning the carrot round. Its a very easy and fast process. See photo below. Basically you scrape off the outer area running the titled knife from top to bottom. Bear with me while I play the superwoman taking photos while cooking. Now for grating. I used a manual grater. I recommend getting your husband to do this, a good way to build muscles!! But mine was napping, so I had to do this myself. 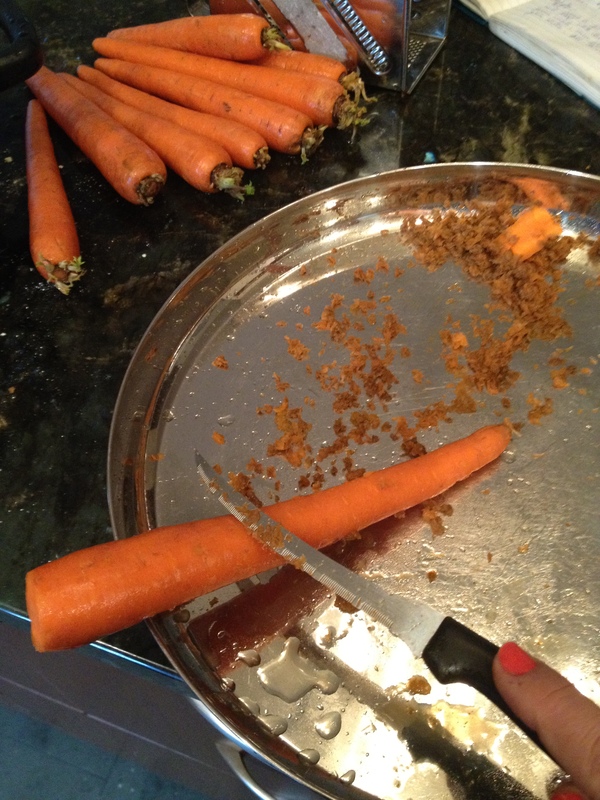 Halfway through I was fretting using so many carrots! Heat ghee. Add cardamom, sliced almonds and cashews and saute for a few seconds. 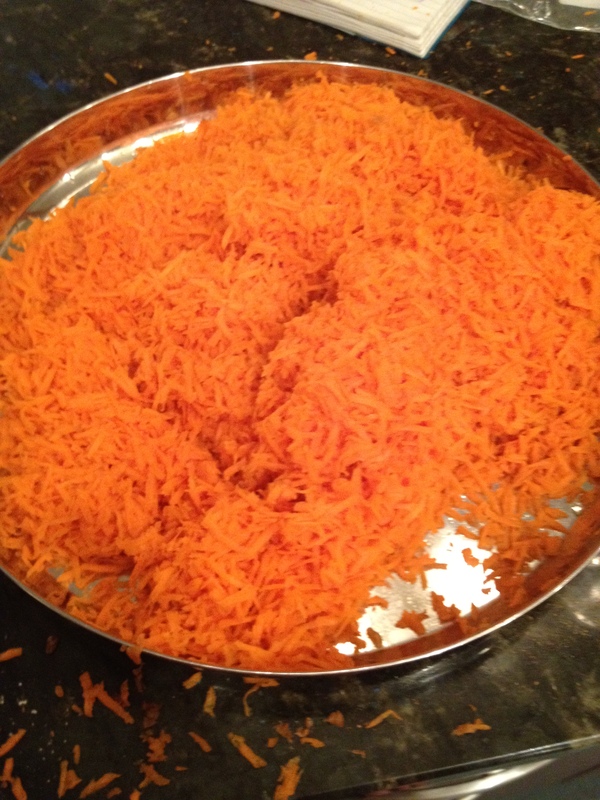 Add grated carrot. Heat on medium to low flame till all the water escapes, stirring occasionally. Carrots give off water, so the mixture has to be heated till it feels dry. It will shrink as well. I am adding photos below, but I added more ghee than required in error, so its harder to tell whether the mixture is dry since ghee keeps it moist. I also didn’t get very good carrots. In India, the carrots are nice and red during season, these are orange and not as juicy. After water escapes, add khoya and 2 cups of milk. Stir till all the milk is absorbed and khoya blended. Add sugar. Mix well and heat till the sugar is absorbed, the halwa comes together in the pan. There are many variations. Some people use condensed milk instead of khoya. If using sweetened condensed milk, skip the sugar. I personally find condensed milk too sweet. Some people also replace sugar with jaggery. I love the halwa only with khoya, I tried without and its just not the same, its like eating sweet carrots. If you want it crispy, let it heat some more and stir occasionally. Throughout the process medium to low flame is fine. Once the halwa is done, leave it out to cool. Garnish with cashews and almonds at the top, silver warq would also look good. Eat it hot or cold. I like it hot, not sure if the silver warq doesn’t work in the microwave. Enjoy! 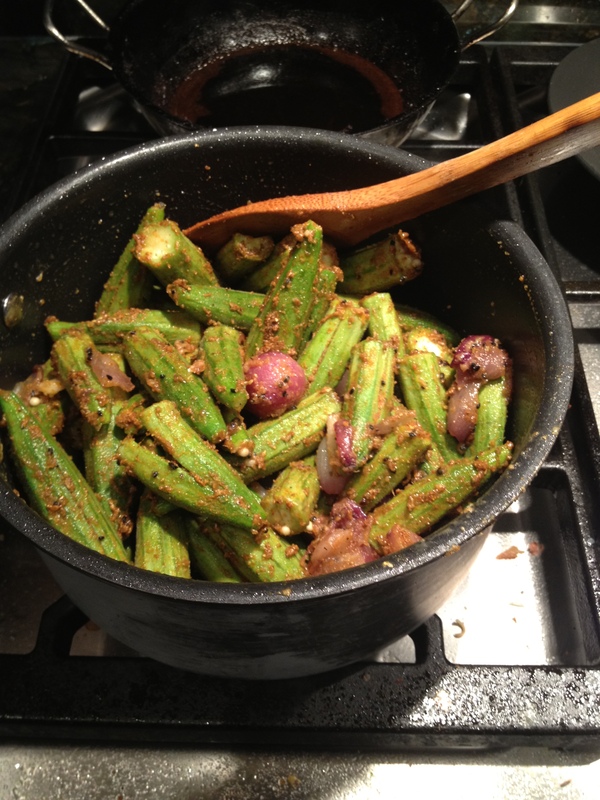 I love love bhindi/okra. Very few restaurants in the city make it well, most of them make it with tomatoes or “kurkuri”/fried crispy okra. I love the one where you fill in spices and cook with gram flour. Since my nosy siblings read my blog, I thought of enlightening them as well with my cooking! I tried to take photos today, I find that photos help a lot for recipes. Besan/gram flour – 1/4 cup, I add 1/2 cup because the spices get absorbed in the flour and it gives a very nice taste. Bhindi/okra 400 grams or 25-30 big pieces, salt, turmeric 1/2 tsp, roasted cumin powder 1/2 tsp, garam masala (can find in any Indian store) 1 tsp, Amchur/mango powder 1 tsp, crushed fennel seeds 1.5 tsp, red chilli powder to taste (I use 1 tsp), coriander powder 1 tbsp (or 3 tsp), onion seeds/kalonji 1/2 tsp, peeled shallots 8-10 (small onions). Trim okra and slit it in the middle, make sure you don’t halve the okra, it should just have a vertical slit on one side without cutting through. Take salt, turmeric, garam masala, roasted cumin powder, amchur powder, fennel seeds, red chilli powder, and coriander powder and mix. Fill this mixture in the slit of every single okra. Sprinkle the remaining mixture over the okra. Pour 1 tbsp of oil over the okra, mix, and place it aside. Heat oil (3 tbsp). Add onion seeds and saute. 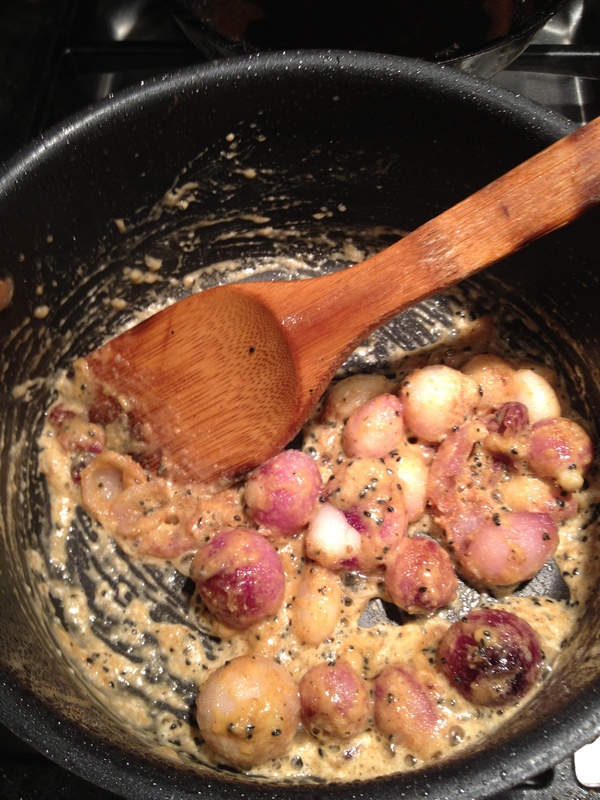 Add shallots and saute for 1 minute. Add besan/gram flour and saute for 2 mins till it turns golden, make sure it doesn’t turn brown and burn. Some shallots may start losing their skin at this point. 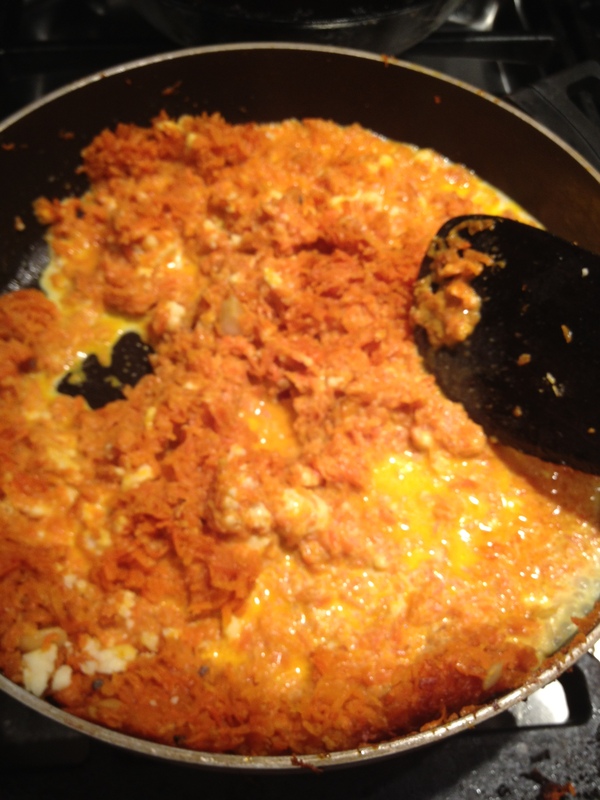 The gram flour will absorb most of the oil. Add stuffed okra/bhindi and mix. Turn the flame to low, cover the pan and let the okra cook. Okra gives off water so you do not need to add water, but if it starts sticking to the pan add some oil. Keep stirring occasionally. It took me 30 mins to cook on low flame. You can make the flame higher but keep stirring. I like keeping the flame low because it gives the spices time to be absorbed fully. Touch the okra and when all of it is soft and done, turn off the flame. Okra usually shrinks to half of what you started with. Garnish with coriander leaves. 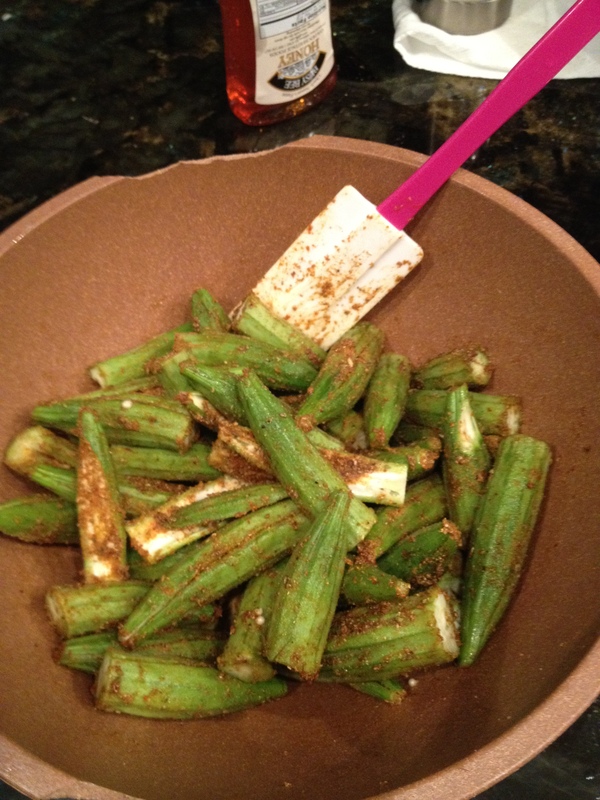 The spices inside the okra make it very tasty, but shallots retail their original taste and don’t absorb spices much. Since I use amchur powder, lemon juice is not necessary, but you can add it at the end if you want. 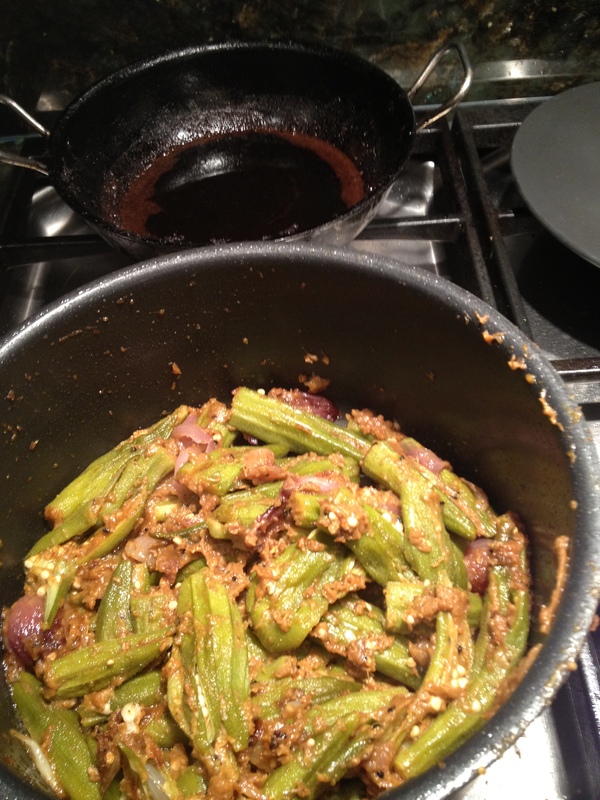 The okra tastes even better the next day, when spices are absorbed and the gram flour turns crispy. Yummy! !